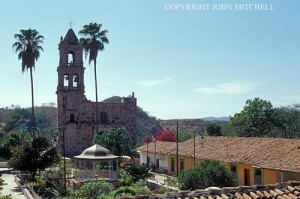 The main plaza and Church of San José in the Spanish colonial mining town of Copala. Click on photo above to see larger version. In a recent Mexico Premiere post, David Simmonds named Mazatlán as his “City Pick for 2011,” so I thought I would chime in and give my choice for the best day trip from this popular resort — the old Spanish colonial mining towns of Concordia and Copala in the foothills of the Sierra Madre Occidental. With their winding cobblestone streets and unhurried ways, these two communities offer glimpses of a Mexico that has all but disappeared in Mexico’s bustling urban centers. Concordia, which lies about 25 miles east of Mazatlán, has a peaceful main square dominated by the ornate baroque facade of its 18th-century San Sebastian Church. In front of the church, vendors sell colorful pottery and hand-carved wooden furniture that are fashioned in workshops around town. There is also an absurdly large rocking chair that looks as if it is waiting for a friendly giant to come along and sit in it. Inside the nearby Municipal Palace, a lively mural chronicles key events in the area’s history from the arrival of the Spanish conquistadors to the 20th century. One panel shows Concordia’s buildings in flames after they were sacked by marauding French soldiers during the 1860’s. Another depicts the long-tailed urraca bird, which supposedly led the Spanish to Concordia’s rich silver deposits. A few miles up the road from Concordia sits the mountain village of Copala. Smaller and more bucolic than Concordia, Copala still feels a bit like the virtual ghost town it once was. Brightly painted colonial-era buildings line Copala’s narrow streets, but the town’s most prominent landmark is the 18th-century Iglesia de San José. A statue of a dour-looking priest peers down menacingly from atop the church’s baroque facade, no doubt checking to make sure that parishioners attend mass regularly. Sunlight streams through high wooden doors illuminating an airy interior with a vaulted ceiling and neoclassical-style altars. After Copala’s silver and gold mines ran dry, many of its citizens left in search of new livelihoods. But the re-opening of the abandoned mines for tourism has revitalized the town. Quite a number of foreign visitors liked Copala so much that they decided to stay. Some have started up funky hotels and restaurants such as the the Copala Butter Company facing the main square and Daniel’s Restaurant, famous for its “world-class coconut banana cream pie” that — as much as anything else — has helped put Copala back on the map. Concordia and Copala can be visited on an independent day trip or organized tour from Mazatlán. There is bus service to both towns from Mazatlán’s second-class bus station. Passenger trucks called colectivos also ply the route between Concordia and Copala. Move the cursor over the slide-show below to view captions. Click on images to see larger versions and for information on ordering prints or leasing photos for personal, editorial, or commercial use. Can tourism help save Cerro de San Pedro?